Improving problem solving skills, creative flow, team collaboration, brainstorming, interpersonal communication skills and presenting of ideas and creations are all by-products of our activities. Programs are available encompassing our Crafts or our Aviation History Programs. We can custom build our programs for the specific age and educational experience of the participants. So . . . LET'S HAVE FUN! Your staff will focus and relax together. Your staff and their families would have the opportunity to sit and be creative together at our unlimited PlasterCraft Painting Tables. 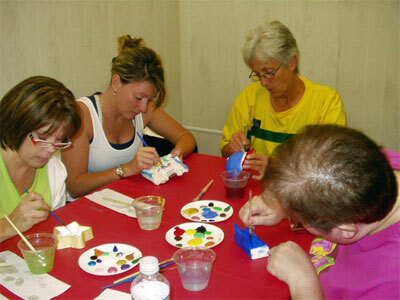 We offer a variety of small PlasterCraft pieces that participants can choose from and then sit at one of our 20 seats and paint together. We find that all our artists stay focused and relaxed. We encourage participation from ages 2-104+. 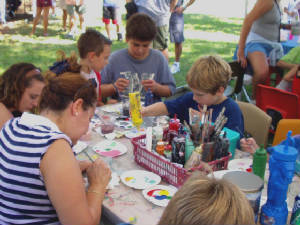 Our paint table is one of the favorite activities for teens, which are probably the hardest group to satisfy. Participants of all ages enjoy pouring the colored sand into containers. We have a variety of bottles with caps...dolphins, footballs, clowns, butterflies, frogs, aliens, dinosaurs and many more. We carry SandArt Twirling/Marching Batons, that the children love to fill and play with, plus a variety of necklaces and bracelets. 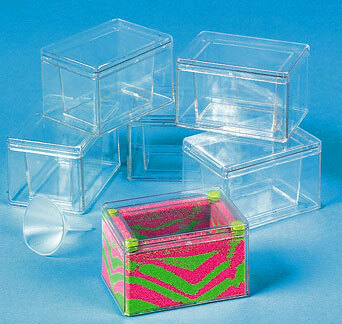 Our newest, most exciting SandArt Containers are a Sand Art Covered Box or Butterfly Craft Kit. Let us put together a SandArt Package for you. The FUN Activity Company that Comes to You!